Congleton Museum’s Remembrance Field is now on display. 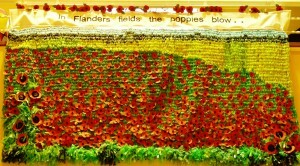 Woven by museum volunteer Trish Lovell from donated plastic bags, and with poppies added by visitors, this fantastic poppy field can be seen in the foyer of the museum. The field started life as a small sample which Trish then decided to enlarge in commemoration of WWI. With recycled plastic bags donated by Argos (blue), M&S and Spar (yellow), and Congleton Council (greens), the vista took shape over a number of weeks. As Trish wove the field on a peg loom in the museum, visitors were able to name poppies in remembrance and insert them into the fabric. All poppies were kindly donated by the Royal British Legion. When the field was completed a banner was added with the words from John McCrae’s famous poem: ‘In Flanders fields the poppies blow’. The field was in place for Remembrance Sunday where it attracted comparisons to the Poppy Moat at the Tower of London . Trish said, ‘If people can genuinely consider that my idea for my weaving is anywhere near the league of the moat poppies, then I am highly honoured’. The Remembrance Field will be on display at the museum for the foreseeable future. 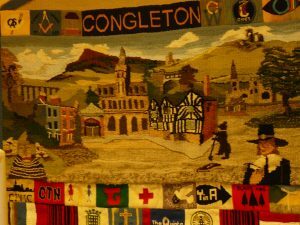 Congleton Museum is now the proud home of the Congleton Tapestry. Displayed in the foyer, the tapestry can now be seen by the general public in its full glory for the first time in its town of origin. The tapestry started life in Sept 1994 at the instigation of Margaret Williamson, then Town Mayor, who had seen a similar one in Nantwich. Volunteers were called for and the idea gradually took shape into three panels: Congleton at Work, Congleton at Play, and History and Landscape. 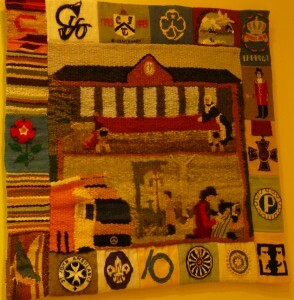 Completed in August 1995, the proposed home in the Town Hall fell through, and the tapestry went off to Chester, and later Manchester, for display. In 2013 Trish Lovell, one of the original weavers, learnt that it had come into the care of Congleton Museum . Since the museum had no room to display it in its full length it was decided to divide the tapestry into its three panels. The Textile Group, led by Louise Adams and Trish Lovell, set to work dismantling and reassembling the tapestry and on 21 October 2014 the tapestry was finally put on display. You can see the tapestry upstairs in the foyer at the museum.